Put a "better" overdrive transmission behind your Ford Flathead. JUST RELEASED - Flathead overdrive begins with the adapter. The MDL Flathead bell adapter, made as a direct fit for the 59 series blocks, while also mating to the intermediate ring on the 8 series flatheads, allows you to install a “better” transmission than an S-10 take-out. Flathead engines produce significantly more torque than a 4-cylinder transmission can handle. Upgrading to the MDL adapter allows the use of a V-8 Fox-body Mustang transmission or the even better gear set found in the new T-5z that MDL offers. Looking for even more capacity? The bell is also compatible with the TKO 5-speed series. 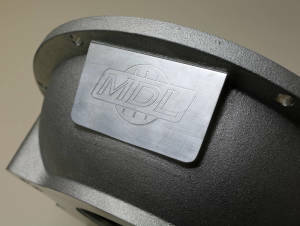 MDL is proud to introduce the Ford Flathead adapter. Designed for a wider range of transmissions than previous adapters, the MDL Ford Flathead adapter will ease the task of adding an overdrive transmission to your Flathead project. Compatibility to blocks from 1932 to 1950, coupled with adaptability to Ford T5's and TKO's insures we have a 5-speed overdrive solution to move your Street Rod, or any Flathead based project, down the road in comfort and style. It's not just an adapter. 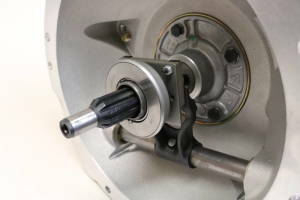 We offer complete kits for the adapter with forks, bearings and cross shafts, to full solutions with transmissions, clutches, flywheels and the whole enchilada. Check out the details below and give us a call or shoot us an email for a complete solution for your project. Complete kit includes shaft, fork, throwout bearing and alignment ring. Improved adapter over existing adapters - Existing adapters are designed for S10 T5 transmissions with their under-performing gear sets, limited shifter position and very limited availability. The MDL Flathead adapter interfaces to Ford T5's which are readily available in the used market, as well as, new. More choices are available as the adapter also supports the TKO series transmission. The 1932-1948 Ford cars sported a 59 series block where the transmission bolted direct to the block. 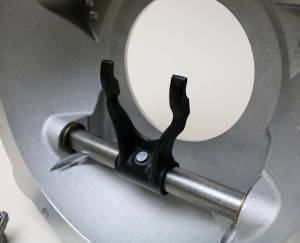 The MDL MD-401-2109 Flathead adapter is compatible with this configuration. The 1949 Truck and 1949-50 Mercury cars used 8 series block's where an intermediate ring was used between the block and the transmission. Our adapter bolts direct to this ring with included hardware. The adapter and kit was designed for modern clutches rather than the old 3-finger design resulting in smoother, lighter pedal feel. Whether using the mechanical linkage or upgrading to hydraulic actuation, you are insured of smooth clutch engagement. Typical Flathead engines are low in horsepower but high in torque. The T5z is a perfect match for these engines. Coupled with our Front Shift T5, the combination works beautifully in your 30's to 50's HotRod without notching the seat or pushing the engine forward to accommodate a stock Ford T5. Wanting even more torque capacity than the T5 offers? Now you can install a TKO-500 or TKO-600 behind your Flathead. 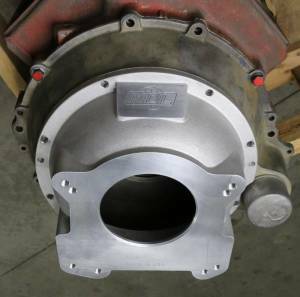 The MDL Flathead adapter is cast and machined in the USA. No more concern about questionable sources and quality of the adapter. 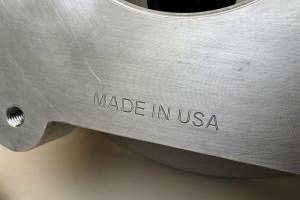 The adapter is cast here in the United States and then CNC machined for repeatable quality. Want to run it with factory clutch linkage? Want to run it with hydraulic clutch release? No problem! Complete kits are available for the configuration you desire. Rather than buy parts you don't need or not all the parts you do need, when you buy from MDL you get the kit specific to your application. T5 and TKO kits differ in the alignment ring to align the transmission to the adapter/crank. Mechanical linkage kits or hydraulic kits differ in the linkage portion. 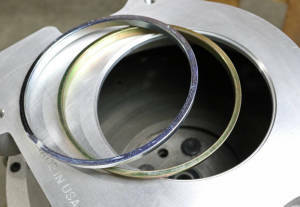 An adapter hydraulic kit leaves out these mechanical pieces and allows the addition of an internal hydraulic release bearing (ordered separately) where the hoses route through the casting where the cross shaft would have been.